What Are the Signs of a High-Functioning Alcoholic? There’s a common misconception that alcoholics and drug addicts are lazy social drop-outs, with no job and no prospects. In fact, this social stigma is one of the biggest obstacles faced by someone with addiction issues and yet, it is not based on fact. Many alcoholics are extremely effective, holding down senior jobs in specialist fields and enjoying a comfortable lifestyle, with little to worry about financially. The types of people who conceal drink issues with a superficial display of being in complete control of their lives are known as high-functioning alcoholics. Because of the widespread misconception surrounding addiction, identifying a high-functioning alcoholic is somewhat more problematic. The issue is also compounded by the fact that the sufferer themselves will consider their lives to be in their control, with alcohol use as a peripheral measure taken to deal with the stress. This kind of delusion or denial can delay acceptance there is a problem and prevent someone from seeking treatment at an alcohol rehab center. Someone with a drinking problem can become known for taking a ‘liquid lunch’ and using alcohol rather than eating food. Although the volume of liquid is likely to be temporarily filling, the effects of alcohol are much more dramatic on an empty stomach and it’s far from a healthy lifestyle. High-functioning alcoholics have a tendency to lose interest in food and to those close to them, this is often very noticeable. A high-functioning alcoholic will display significant changes in behavior when under the influence. Normally shy people become unusually gregarious; mild-mannered people overly aggressive and otherwise organized individuals can seem to be fuzzy-headed and disconnected. When alcohol is abused for prolonged periods, certain behaviors are triggered that can be the polar opposite of what others are familiar with. This is a very obvious sign to people close to a high-functioning alcoholic that there is an addiction issue at play. Although it can take a while longer for high-functioning alcoholics to recognize they have an issue with drink, their behavior while in the grip of addiction is something they are consciously aware of. However, one of the main signals of addiction is a loss of control over cravings for alcohol, which someone holding together a respectable front does not want to admit to – either themselves or others. For this reason, it is inevitable that they make excuses for their behavior in an attempt to justify and defend their relationship with alcohol. “I need a drink to help me unwind” or “I have a lot of stress to deal with in my job” are common ‘reasons’ given for being a prolific drinker. This pattern of making excuses serves as a red flag to others there’s an underlying issue while enabling the alcoholic to continue avoiding treatment at an alcohol rehabilitation center. Someone concealing a drinking problem will also hide alcohol around the home or office or wherever they have to be for more than a few hours at a time without openly being able to drink. This is all part of someone’s recognition of their own abnormal behavior while remaining in denial that it’s an issue requiring inpatient alcohol rehab. As with all addicted behavior, there are repetitive cycles on several levels. The principal repetition is the frequency and regularity of drinking and underlying that is a repetitive urge to give up from time to time. 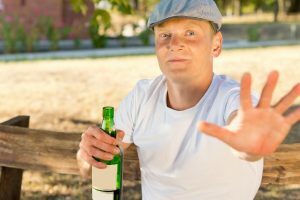 Although high-functioning addicts go through this cycle continuously as part of their delusion they have a handle on the problem, they still adamantly refuse to seek inpatient alcohol rehab. The principal issue a high-functioning alcoholic has to deal with is control. Generally, people with this kind of addiction are considered ‘control freaks’ by those that live and work with them and they can often be convinced they are capable of quitting drinking through their own efforts. It is this unwillingness to relinquish control in a specialist alcoholism treatment program that deters many from seeking help. Alcoholism has no single characteristic in every alcoholic and that’s very evident in cases of high-performing individuals with alcohol dependency and addiction. In many ways, it is the superficial display of supreme self-control characterizing high-functioning alcoholics that conceals the issue completely, allowing the problem to worsen further. People used to being in complete control of their lives can often believe themselves capable of controlling their alcohol use, making them reluctant to seek specialist support at an alcohol rehab center. From the point of view of someone close to a high-functioning alcoholic, a key consideration is the fact that they are fully aware of their drink problem and the only thing preventing them from attending an alcohol rehabilitation center is usually because of control issues. Helping someone with this kind of alcoholism to recognize that control isn’t relinquished in an alcoholism treatment program and that they can, in fact, find more empowerment than ever before with effective treatment, is the best way to encourage them to seek help.